another 18 months of the 2005 transportation bill. jeopardize a quick passage of this extension." and say [a gas tax hike] is the solution, they’re not going to buy it,"
increase in the gas tax, which has remained static since 1993. House effort to pass a bill this year. extension period of the existing law. broader six-year transportation bill before 2011 look slim right now. driving her support for a "clean" 18-month extension. I’m not so sure that extending the current Bush-era transportation legislation is good idea. One of the problems is the requirement that 80& of the funding has to provided by the local and/or state government in order to get any transit project started. There are many people like me who for various mental, economic, and political reasons can no longer drive. Another problem is that there should be more funding available to transit agencies to both avoid service cutbacks and add to their systems. We’re living at a time where the highway/suburban sprawl paradigm is no longer valid. 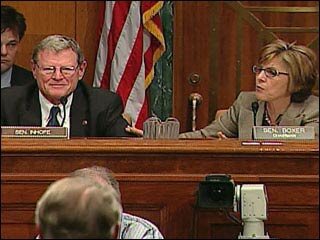 Appreciate Inhofe’s cojones; but where were they during the Bush Administration? I suppose it’s easy to promote a gas tax when it’s a democratic president who has to sign it? Last-Minute Deal Preserves Bike/Ped Funding. But For How Long?